teacher productivity or personal use. HSU, Y.S. & HARGRAVE, C.P. (2000). Survey of Instructional Technology Courses for Preservice Teachers. 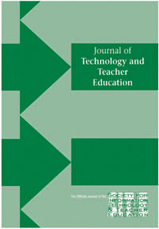 Journal of Technology and Teacher Education, 8 (4), 303-314. Charlottesville, VA: Society for Information Technology & Teacher Education. Retrieved April 24, 2019 from https://www.learntechlib.org/primary/p/8039/. Abdal-Haqq, I. (1995). Infusing Technology into preservice teacher education. ERIC Digest. (ERIC Document Reproduction Service No. ED 389 699) . Henry, M.J. (1993). Profile of a technology using teacher. Paper presented at the meeting of the Eastern Educational Research Association, Clearwater, FL. M i lken Exchange on Educational Technology. (1999). Will New Teachers be Prepared to Teach in a Digital Age? Milken Family Foundation. Office of Technology Assessment. (1995). Teachers and technology: Making the connection. (Report no. OTA-EHR-616). Washington, DC: U.S. Government Printing Office. Oke, L. (1992). The need for technology instruction in teacher education. Exit Project, Indiana University at South Bend. Olson, L. (1987). An overview of the Holmes Group. Ph i Delta Kappan , 68(8) , 619-21. Panel on Educational Technology. (1997). Report to the President on the use of tehcno logy to strengthen K-12 education in the United States. Washington, DC. Schrum, L. (1994). First steps into the information age: Technology infusion in a teacher education program. Journal of Computing in Teacher Education, 10(4) , 12-14.